No way the Movement 515/RunDSM student activists were going to let bitter winter weather ruin their MLK Day observance. After all, it’s not like injustice gets called off in the event of bad weather. 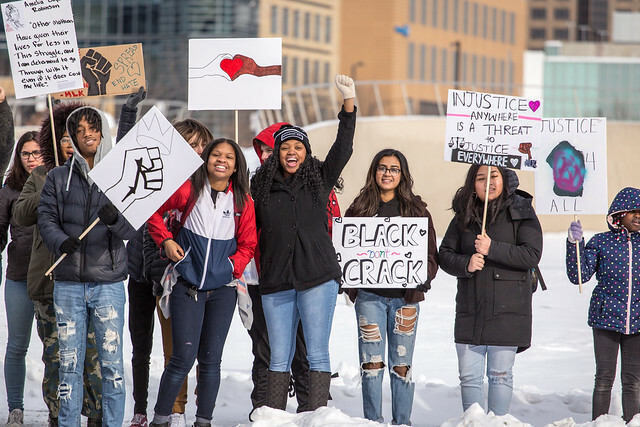 An energetic contingent gathered in the Urban Leadership wing of Central Campus for “A Day to Repay MLK: Community Art for King.” After a quick lunch it was on to creating placards and poetry conveying themes of racial justice and freedom in support of Dr. King’s legacy. Everyone then marched to the Pappajohn Sculpture Park where the original plan was to hang messages from the trees and engage the larger community. Problem was, the larger community stayed indoors, cowed by the cold. Instead the group chalked it up as an opportunity to practice walking the walk in addition to talking the talk. Nothing in there about exceptions for extreme wind-chills. Sure it was raw, but this day was not going to be about the beginning of the end of anyone’s life. Rather, it was about lives just beginning to hit their strides and find their voices. Up there in Room 3405 at Central Campus, MLK Day isn’t a day to take off. It’s a day to speak out. In that respect, it’s just like every other day of the year. East High School Theater Students Present, Noises Off!